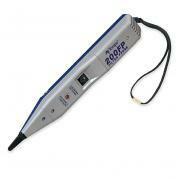 Detailed listing of our tone & probe testers. 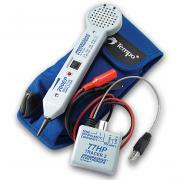 A must for efficiently tracing, installing and troubleshooting telephone, data, security/alarm and electrical systems. Greenlee's professional tone & probe set includes both the 77HP high power tone generator, 200EP inductive amplifier and convenient Cordura carrying case with belt loop. The 77HP Tone Generator features an easy to read red, green, yellow LED display, extra powerful signal allows reception up to 50,000 feet. Now this industry-standard toner also adds selectable warble tones, continuity & polarity indicator lights, short circuit LED Beeper, RJ-11 & RJ-45 sockets and cordset with both 6A-Style alligator clips and RJ-45 modular plug cord. The updated 200EP Speaker Probe has increased sensitivity, an added headset jack for distruption-free toning, a telephone testing port and also an LED flashlight in the front for accessing those dark wiring closets with ease. As always it also includes adjustable volume control, start/stop button, LED light for visual signal strength indication and includes a spare non-conductive tip and optional metal probe tip. One year warranty. Includes test set and carry case. Make it simple to test any configuration of pairs in eight position modular jacks and plugs. With this combination tone generator and breakout adapter, you can now test continuity, polarity, send tone and supply talk battery to any pair. Water resistant design. Virtually eliminates power related noise from the tone-and-probe operation with three types of noise filtration. By selectively filtering out harmonics, the 200FP can be used with any tone generator for faster and more accurate cable and wire identification. The Klein PROBEplus Tone Tracing Probe makes it easy to trace wire paths and identify cables in common low-voltage wiring applications. It is equipped with a dual mode power button and a LED indicator. The amplifier overload LED improves accuracy and recessed buttons prevent accidental operation. This tone tracing probe is designed for use with other Klein VDV test tools and many other manufacturer's analog tone generators. The TONEcube Tone Generator from Klein Tools generates a clear tone signal (with five different selectable tracing tones) for tracing wire paths and identifying low-voltage cabling. It delivers constant output levels for useful battery life and momentary slide switches to prevent accidental operation. This tone generator is designed for use with other Klein VDV test tools as well as many other manufacturer's analog tone probes. Breakthrough IntelliTone™ digital signal technology finds cables other toners/probes can't. Advanced sensing modes accurately find the correct cable bundle and then rapidly isolate the exact cable from within that bundle. Two audible controlled songs and LED signal strength indicators simplify cable location, even in noisy environments. Digital signal rejects noise and safely tones active networks. 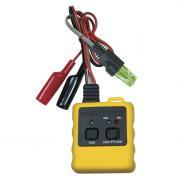 Cablemap checks end-to-end cable continuity and basic miswires. Identifies and troubleshoots services with datacom link, two line telecom, continuity and polarity. Powerful talk battery capability tests telecom circuits. Digital signal locating technology that's guaranteed to find cables others can't! Only IntelliTone™ Toners and Probes bring the performance breakthrough of digital signal technology to common problems that you face installing, maintaining, changing and troubleshooting networks. IntelliTone™ locates and isolates even the most elusive, hidden or bundled voice, data and video cables quickly and reliably, even on active networks with an improved wiremap startup process. Dramatic gains in speed, precision and productivity have made analog tools obsolete. The antenna is now in the tip rather than just below the tip. 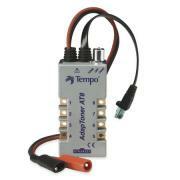 This assists with noise immunity as the user can get the antenna (tip) closer to the signal. 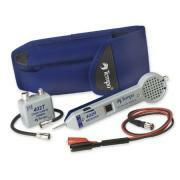 IntelliTone™ kit includes IntelliToner™, 200 Toner and 200 Probe, coax F connector adapter, RJ-11 (2) and RJ-45 (2) patch cables, test leads with alligator clips, lanyards, owners CD and quick start guide and 9V batteries (2). Network Optimized Tone and Probe Set easily traces both active and inactive wiring to either the patch panel or to Hubs or NICS. Finally, a special tone and probe designed specifically to meet the needs of datacom users! The new Psiber Cable Tracker Tone & Probe Set is designed from the ground up to be used in Network and LAN environments. Toning an active LAN circuit can disrupt network traffic and is difficult to track due to cable twist and tone bleed. The Psiber Cable Tracker Tone & Probe solves both these problems. Not only can it tone and trace inactive wiring, including highly twisted Cat 5e & Cat 6, but it can also detect and send link activation signals for tracing active drops to a Hub or NIC card! Designed specifically for network managers and datacom technicians, the Cable Tracker Tone & Probe Kit features a unique Port ID function blinks the link light to identify a connected hub or switch port and provides a simple method to identify switch or hub port assignments on active networks. Three different blink rates ensure compatibility with equipment from a wide range of manufacturers. When tracing inactive wiring, a unique split pair toning capability allows tone to easily propagate through highly twisted Cat 5e and Cat 6 wiring. In addition, two user selectable audible tone patterns are provided for inactive circuit tracing. The Psiber Network Toner has a female RJ-45 connector for easy network connection as well as alligator clips for connecting to a punch down block or unterminated cables. The toner also detects wiring shorts with its built-in continuity check. Auto power down extends battery life and a built-in low battery indicator warns when battery replacement is required. The Psiber Probe incorporates volume control, non-conductive plastic tip, and is fully compatible with traditional toners. Kit includes Tone & Probe and a Cordura carry case. Shipping weight of this kit is 3 pounds. Now you can tone through splitters, directional couplers and traps. The 402K is simple to use and provides fast, accurate results. The transmitter and receiver are equipped with female F-connectors and the kit provides both audible and LED test and tone indications. Designed specifically for the CATV industry, the 402K will send tone through any passive device along the cable path. No more long delays trying to figure out non-tagged or mistagged cable drops. With its user defined tone output, up to four 402T Toner units can be used simultaneously for tracing multiple cables runs. 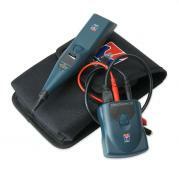 As a continuity tester, the 402K provides both audible tone and LED display to indicate resistance levels. The unit will even identify the presence of AC or DC voltage on the cable under test. The Fluke Pocket Toner NX8 Deluxe Kit is the premier tone & tag tool for the CATV and Residential Low Voltage Wiring professional. Unparalleled ergonomic design, versatility, and durability makes this a must-have tool for tracing, tagging and testing installed wires & cables. 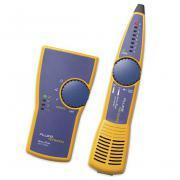 If cable identification is the task, the Fluke Pocket Toner NX8 Kit is the answer. With the ability to test up to 8 outlets at once the PTNX8 is the most efficient Tone and Tag tool anywhere. In addition to identifying the correct ID cap at the other end, the new LED display clearly indicates, shorts, opens, AC or DC voltage, continuity and generates an audible tone. The Pocket Toner NX8 natively supports coaxial cable with F-connectors but with the included array of adapters in this kit, you can tone and tag telephone, LAN, audio, video, security, or virtually any type of wire or cable. 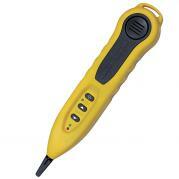 Fluke's Pocket Toner NX8 gives you important information about the test line with its unique 8-segment LED indicator. The 8 include ID tags also feature an LED light to clearly indicate continuity and speed the testing process. Operation of the tool is simple. Plug the head (sending unit) into a wall plate. When the power switch is turned on, the sending unit applies a mild voltage to the line being tested. If there is a splitter or a short in the line, the LED display on the head of the unit will illuminate an "S" for short. If the other end of the cable is has a 50-75 ohm terminator attached to it, the LED will show a "C" or the corresponding ID Cap number to indicate continuity. Unscrew the toner unit from the bottom of the tool and touch it to the other end of the cable. When the correct cable is found, a loud tone will sound to indicate continuity. 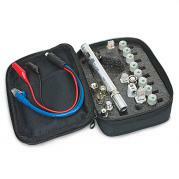 This Pocket Toner NX8 Deluxe kit comes in a compact zipper case and includes 8 ID Caps, adapters for F-Connectors, Alligator clips for bare wires, RJ-11, RJ-45, BNC,RCA connectors and the unique NEW Dial Tone Detective for instant dial tone detection.